Really intresting and excellent article - and great photos to look at. 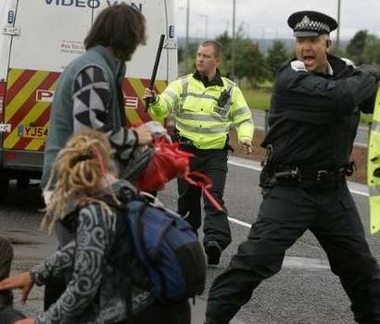 most, if not all, of the g8 deals had been done by the time the protests started. 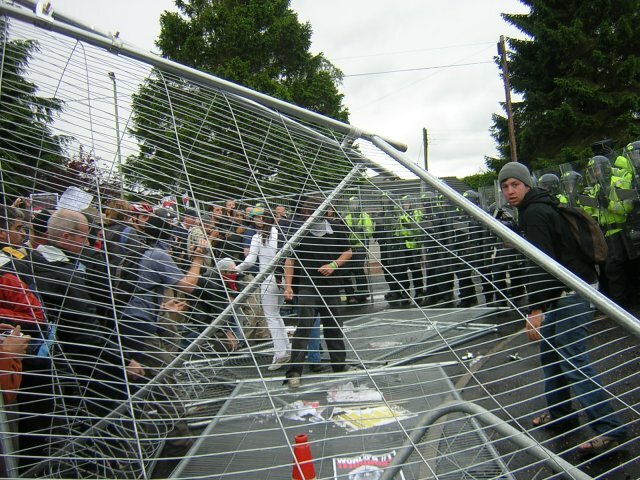 so in that sense the blockades to close down the g8 were primarily symbolic, but nonetheless important. 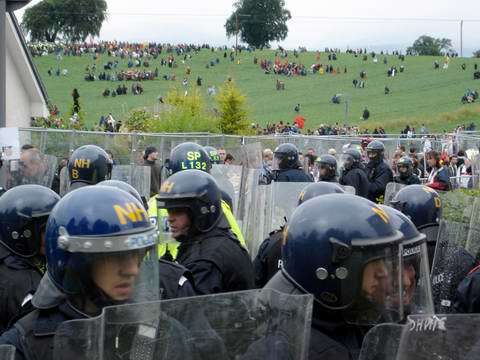 yes we were tactically effective, and the M9 drumming blockade was an important node in the days' events, tying up a lot of the more up-for it- police, enabling other blockades and lock ons the time to work. and we were there for ages holding the road. 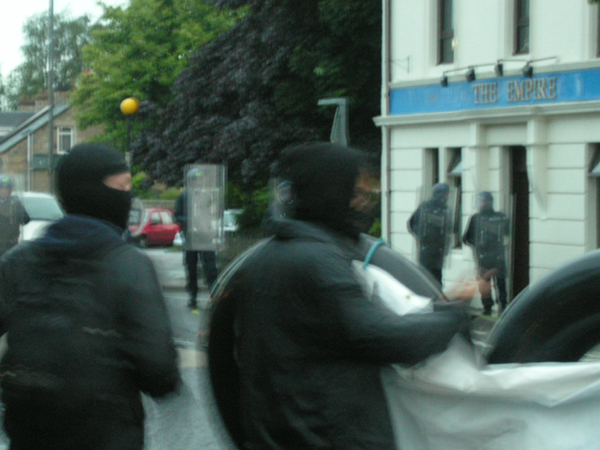 there weren't enough of us to hold the road for very long, once enough "steaming for a riot" cop vans hurled into view. we'd played tactical cat and mouse for a bit, enough to hold a line with them keeping a distance. after about 40 mins or maybe more having lots of fun on the completely silent, car free motorway doing some samba dancing with onlooking bemused locals peering at us from the footbridges, when the cops 200 + yards away looked like they were going to pile in, we'd withdrawn back from our original position and barricade, and were walking back to meet another group of 50-70 activists on the motorway further back towards junction 10.
a collective decision was made to tactically withdraw. 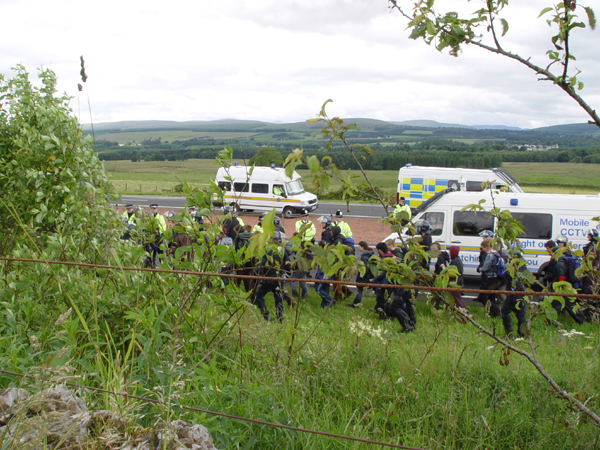 the days objective was hutting down the motorway and disrupting/shutting down gleneagles, not rucking with the cops. we were at that point still on the motorway. much better, in my opinion, than being hemmed in in city streets. nature provides more escape routes. we were all over that landscape and we completely tactically out manouevered Plod, collectively. nyah nyah nyah nyah nyahhhhhhhh!!!!! my affinity group did precisely that -getting onto the motorway, and escaping the cops and not being hit or nicked, by disappearing back into the trees. in my opinion a successful action and i was free and still mobile. if i'd stood and fought i'd have got hit and nicked. there was no way those police vans were stopping, we had to get off that side of the motorway to avoid being knocked down, if anyone had falllen over they could have been killed. 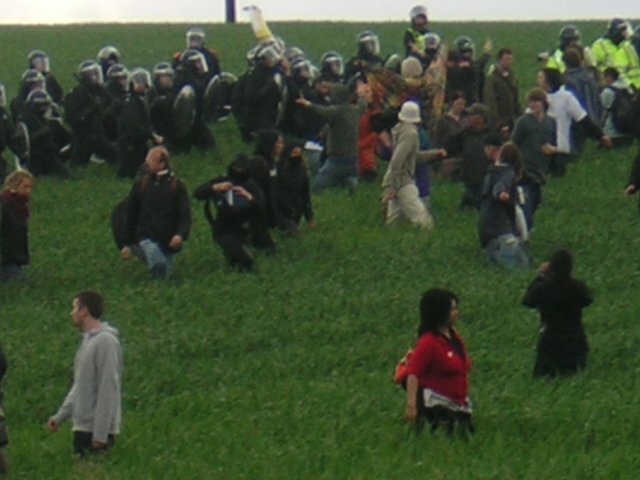 the 2 groups of us were now running towards each other to try to regroup- the vans stopped and piled into the 2 groups, with people now running away off the road into a neighbouring field, from riot cops who looked at least from a short distance away, like they were hitting people. it looked like the beanfield. i am glad i wasnt in the middle of that. 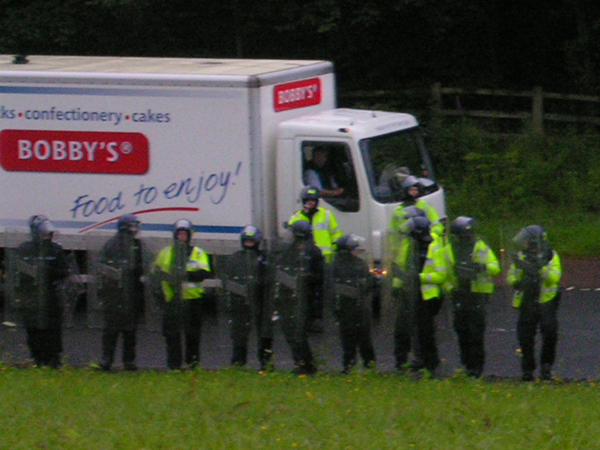 actually the cops main objective initially was to clear us off the motorway, v few of them initially came over onto the field, but people understandably panicked and legged it, causing the bullocks to stampede. unfortunately one young woman was apparently seriously injured by stampeding bullcocks , i understand she broke her leg but have no confirmation of this. 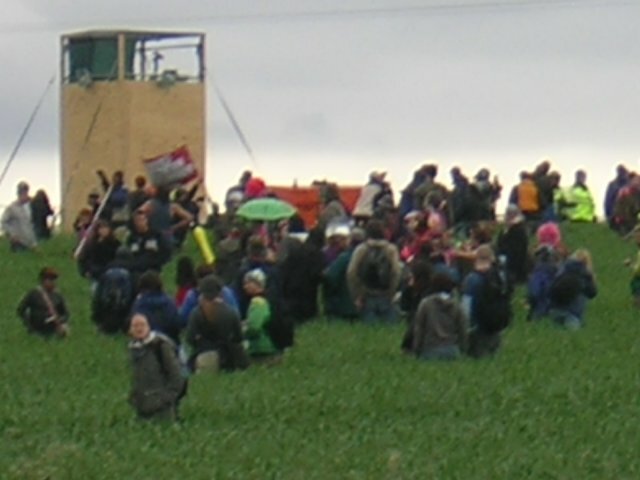 the farmer arriving back had a perhaps understandable, though compltely unneccesary, over reaction to the activists who were leaving his land as quickly as possible. he thought his family were being threatened, but he did the classic 'get off my land' thing. 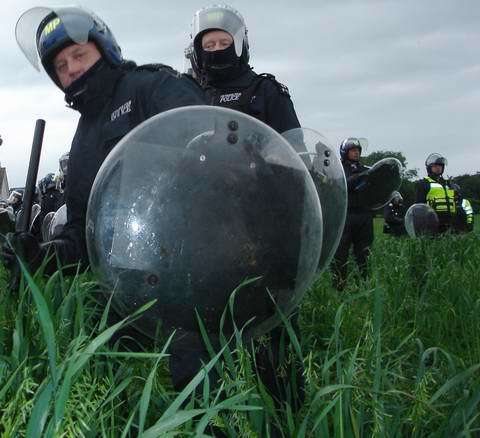 in fact his family were being reassured by one activist and the farmer was being asked for his grid reference for the farm, for the ambulance, by another, trying to avoid being hit by a hammer. heigho. not the greatest of outcomes but worse was that plod decided to nick everyone they could find, not sure of details as i'd got back up the hill by then. hopefully enough people got away there, i know quite a few did, there were good escape routes but they needed looking for, and i very much hope no one was injured by police, as it looked like it could have got hectic. unfiortuntely not many activists at this point found the rather hidden pathway leading round the cliff edge and back up the wooded slope to the top of the hill.